This is the third article in a five-part series on how a company or organization can develop, implement, and sustain successful public-private partnerships (PPP) that achieve large-scale impact. Click to read part one on determining who to work with, and part two on determining when and how long to engage. How does a company or organization develop and sustain successful public-private partnerships to achieve large-scale impact? Determine how to execute: The partnership must develop a clear vision, differentiated strategy, and detailed execution plan to drive long-term success. This includes defining outcomes for the PPP that are informed through stakeholder input, establishing an effective governance structure with clearly defined and transparent operating practices, and agreeing upon roles and accountabilities in advance. In our partnerships we’ve found it helpful to identify and fund a program management lead who is solely responsible for successful program execution. Successful PPPs have both a defined business model (eg. “build, operate, own” like Cisco’s Networking Academy model, or “invest, transfer” like our Community Knowledge Centers (CKCs) model) and a defined solutions model that considers key risks, scalability, replicability, and long-term sustainability. Developing an exit or transition strategy is also a critical component of early discussions to ensure clear expectations from all parties. Even the best planned partnerships can be disrupted by technology transitions, government changes, or serious funding challenges, making the development of multiple exit or transition strategies necessary. The Jordan Healthcare Initiative (JHI) was a strategic collaboration between Cisco and the government of Jordan with a clear vision to improve the efficiency of and access to quality healthcare services for people in Jordan, particularly those living in rural and/or underserved areas. Four JHI projects were clearly defined and implemented in collaboration with multiple partners, including the Jordan Ministry of Health, Jordan Ministry of ICT, and the Royal Medical Services, who each had a defined role. By collaborating closely with the Jordanian government through JHI, Cisco provided our expertise in networking, security, and collaboration technologies to enable telehealth solutions, and established our credentials as a good corporate citizen and reliable business partner. The journey to the Jordanian capital of Amman is a daunting one for rural patients who require specialty medical care. They must leave the familiar behind to travel hundreds of kilometers to a hospital where they wait in long lines for a consultation. In 2012, Haifa Abd-El Karim Omoush (pictured at right), a 34-year-old married woman with five children, was suffering from a treatable cardiac condition. Her local physician referred her to a specialist in Amman, but she missed or postponed her appointments because she had no one to care for her children and could not afford to travel to the hospital. When Haifa learned about a new care-at-a-distance clinic in her own community, she was able to connect with a cardiac specialist in Amman, who immediately diagnosed her and adjusted her treatment plan. The care-at-a-distance clinic helped Haifa’s condition improve and this gave her more time and energy to spend caring for her family. Connecting urban specialists with rural patients and physicians via technology extends the reach of providers, increases access to healthcare, reduces costs, and empowers patients. Through JHI, our support and solutions enabled the delivery of affordable, quality healthcare services to remote and underserved communities, contributing to the Jordanian government’s goal of improving quality of life for its people and its communities. JHI contributed to the transformation of healthcare delivery in Jordan; and from 2011 to 2015, over 176,000 patients benefited from the initiative. 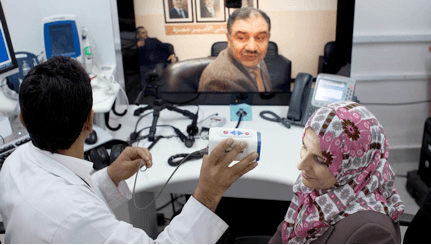 The telehealth technology solution is still in use at the care-at-a-distance clinic at Al-Mafraq Government Hospital where Haifa received care. Prince Hamzah Hospital in Amman is currently connecting daily with Al-Mafraq Government Hospital and Queen Rania Hospital, a rural hospital in southern Jordan, with an average of 25-30 cardio, dermatology, and nephrology consultations a week. Has your organization had success in determining how to execute public-private partnerships? Leave us a comment below, tweet at @CiscoCSR and stay tuned for next week’s PPP post on how to ensure long-term sustainability. Join us September 21, from 10-11 a.m. PT, for a #CiscoChat with PPP thought-leaders Laura Quintana, Vice President, Corporate Affairs at Cisco; Laurence Carter, Senior Director of Public Private Partnerships at the World Bank; Keith Davis, President & CEO of the Camden Dream Center; and Jen Boynton, Editor in Chief at TriplePundit.